Below is the text of Philip Drew's presentation to the John Andrews Symposium on Saturday October 20, 2012 at the David Caro Building at the University of Melbourne. John is aged 79, a diabetic, has had his left foot amputated as a result, and is far from well. The Department of Architecture therefore arranged to bring together members of his former office at Palm Beach, Jennifer Taylor, to discuss his work. The Palm Beach Symposium was a unique opportunity to hear Andrews explain his architecture and life. Quite special for that reason. 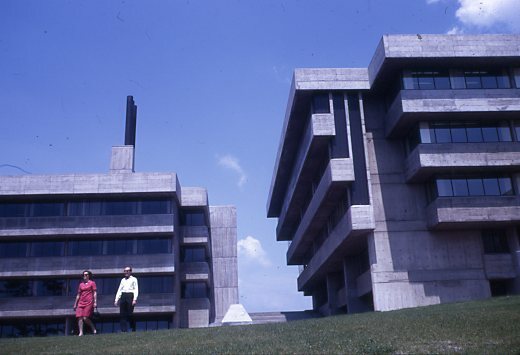 John was the first Australian born architect to attract international notice, and while his later commercial buildings Philp Drew notes were fairly predictable and less interesting, Scarborough College east of Toronto attracted great attention in 1967 for its innovative educational programme and remarkable combination of landscape and Futuristic Brutal concrete. Sydney connections are in abundance: John Andrews father was a Methodist stone mason who made headstones from his yard on what was Sydney's Anthony Hordens site and is now Sydney's World Square. In his talk, John remarked that he decided he preferred working with the living rather than the dead so chose a career in architecture instead of following dad. John Andrews studied architecture at the University of Sydney, which sadly showed no interest in participating in the Palm Beach Symposium. After he returned to Australia in the early 1970s, he set up his office in the sail loft of a working boat shed on the Pittwater side of Sydney's Palm Beach -- a very Aussie lifestyle! John designed the King George Tower in George Street and the octagonal plate offices at Parramatta. Megastructure comparisons arose following the completion of his Scarborough College in Ontario, 20 km east of Toronto. Megastructures were the fashion at that moment, but no one was really sure how to define them other than as large complex structures that concentrated many city functions within them. Their popularity was short-lived, but they, or rather the idea, was taken up in Science fiction and many cities such as in 'Star Wars' where such giant megastructure urban agglomerations on many levels are intertwined by transport articulations running through them in startling fashion. John Andrews never realised anything like Scarborough later, it was really a one-off based on the then novel use of television instruction in a way that anticipates the internet today and the concept of COOMS, that is, university courses of high standard freely available around the globe delivered via the internet. Universities without buildings or lecture theatres. I arrived in Toronto, Ontario, in September 1967, in time to catch the tail end of Expo’ 67 in Montreal. It was an extraordinary event/celebration architecturally as well as politically: there was Buckminster Fuller’s huge 200 ft (61 m) transparent geodesic bubble (61 m) US Pavilion, Moshe Safdie’s extraordinary, Habitat ’67 to house 158 families, and Frei Otto’s stunning cablenet roof mounted on steel masts with suspended fabric skin Federal Republic of Germany pavilion. The Montreal Expo coincided with the centennial of the British North American Act, 1867, which united Upper and Lower Canada (Ontario and Quebec) and established Canada. Recently arrived, I waited in the long queues to enter the many national (there were 62 spread across 1,000 acres at a cost of $1 billion) and provincial pavilions: From all over, Canadians were meeting and conversing with one another, discovering for the very first time who they were, what they shared in common--their identity as Canadians. They were discovering what it meant to be Canadian. Before then, they were citizens of a province --British Columbians, New Foundlanders, Quebecois. Their loyalty was to their province not Canada. I witnessed a burgeoning recognition, a new awareness and pride in belonging to Canada. It was an exciting and highly energizing experience. Quebec, at a time, was fiercely seeking to separate and become an independent French state in North America. The Quebecquestion hung in the balance. There was strong popular demand within Quebec to secede—a catastrophic event should it happen which would have isolated Western Canada from the Maritime provinces and blocked access to the Atlantic. It was in the lead up to this national awakening and growing political schism between English and French Canada that an unknown Australian architect, John Andrews sprang to world prominence. I decided to move to Toronto, in part, inspired by the fame of Scarborough College. Andrews arrived in Toronto as a result of his participation in the Toronto City Hall International Competition. He submitted an entry with four graduate students that was one of seven unsuccessful submissions. Andrews and fellow student Macy DuBois came to work in Toronto on the second stage, subsequently Andrews worked on the city hall project with Viljo Revell’s Canadian partner firm, John B. Parkin Associates. Parkin Associates was responsible for the new T1 Terminal at TorontoPearson International Airport, Malton, and the Miesian style Toronto Dominion Bank Tower. One building, Scarborough College, was responsible for John Andrews’ breakthrough and recognition on the international architectural scene. He was just twenty-nine in 1962. Publication in Time magazine was largely responsible. Andrews at first demanded front cover treatment, but the editors at Time reject his audacious demand. Belated publication in early 1967 gave him international recognition. Overnight, the Time coverage gave Andrews instant international architectural stardom. New trends emerged in the 1960s; besides its entertainment function, television was envisaged as a powerful new education medium. Cinema generally, and Canadian cinema in particular, in the wake of the post-Second World War economic recovery, was experiencing a renaissance. Expo67 highlighted the potential of cinema as a dynamic, creative, technically experimental, and popular art form. The nerve centre of Scarborough was the main television studio 160 x 50 ft (48 x 15 m) supported by five adjacent smaller studios. The center was designed to handle eleven instructional programmes at once, reaching, in total, 50 classrooms. Except for educational films, Scarborough would produce all its own TV instructional material, including 60% of its video tape. John Andrews likened his building to an Italian Hill Town. The comparison was somewhat fanciful when compared to such picturesque assemblies of cubic stone-and-tile villages piled on hilltops. Scarborough was a brooding monolithic presence, more like a Buddhist lamasery in Tibet than Italian Hill town. Time magazine pointedly referred instead to its “aggressive asymmetry”. More indicative was the placement of the humanities in a stepped out east wing, with science in the larger sloping west wing with its 30 skylight science labs holding 20 students that were also available for use by non-science classes. Study and lounge areas were provided for the student body bringing everything under one roof. At older universities such as Oxford and Harvard, the buildings were arranged around courtyards. At Scarborough there are no courtyards, in their place, a corridor ran the entire length of the wings and served as an indoor street lit by natural light streaming down from overhead. Scarborough was the forerunner of a trend that would become commonplace in universities today; this is the adoption of the internet for disseminating course materials, demonstrations, lectures, and student work submissions. My first employer was Richard Strong of Sasaki & Strong. Strong, a friend of Andrews, and member of the INTEG group was professor of landscape architecture at the University of Toronto. The downtown Toronto office was at 45 Colborne Street, next door to 47 Colborne the address of Andrews’ office. The pair shared a printing copying service in the basement. On the corner nearby, a coffee spot offered a small but cozy meeting place for staff from both offices where office- and the latest gossip were exchanged. In 1968, I encountered Ed (Edward A. Galanyk) who told me the inside story of Scarborough College and how Andrews won the commission by jumping in early and presenting the University with a near final design and model before other architectural firms in the city could present their proposals. Ed Galanyk worked on the design and model with Andrews and a few others in a small team. It was done quickly working long hours over six weeks to ready the design and model for its early presentation to the University of Toronto governing body. One of Canada’s foremost landscape architects, Michael Hough had been retained by the University to advise it on the development of its Scarborough college site 20 km east of the city. Scarborough was one of two proposed satellite colleges to cope with an expected jump in student enrollments from 19,000 fulltime students, to 35,000 by 1970. The second site was Erindale, to open the following fall. Its master plan was supplied by Andrews. The site was typical of the northern lakeside coastline of Lake Ontario. It occupied a large elevated 202-acre site intersected by a deep ravine. Michael Hough had recommended the new college buildings follow and cap the irregular line of the escarpment edge. This generated a linear building which, accordingly, assisted in stabilizing the fragile ancient sand and clay of the Scarborough Bluffs. In this way the building would stabilize the sides of the ravine which fell precipitously to a narrow wooded V-shaped valley studded with centuries-old hemlock, pine, maple and beech. The building, in turn, would act as a defensive wall holding back erosion of the fragile landscape. The intervention by Hough, which Andrews was sensible enough to follow, in part explains why Scarborough is such an exception and departure from later projects. It is one of the rare examples where Andrews sensitively recognised the important role played by landscape in shaping his architectural form. It is the least rigid of Andrews’ designs. It is difficult to think of another project from his oeuvre that adopts such a sensitive stance towards landscape. In the main, Andrews output exhibits a hard engineering edge, his concern is chiefly with movement and traffic flows, utilising a clear additive geometry, composed of squares, rectangles, octagons, or triangular units as floor plates. His architecture generally is not receptive to landscape cues—the impression is one of mechanical hostility opposing the magnificent multiform variety of nature. Andrews responded to climate in a direct practical way, which to some, must have seemed obvious. The winters were harsh, temperatures with a wind chill factor of from -15 to -20ºC. Scarborough College has a continuous enclosed street that runs the length of the wings and links lecture halls, laboratories, offices and student amenities within the same interior environment. It was possible to reach any part without physically venturing outside. It seemed so obvious at the time, yet it was novel and revolutionary. Canadian architects had failed to see the obvious. At Waterloo University, as I recall, one bright spark had exploited the service tunnels that held piped services across campus. These were designed to allow engineers direct access, and put them to use as underground student walkway links between buildings. These tunnels were connected to the stairs in each building and made natural and convenient routes across the campus. 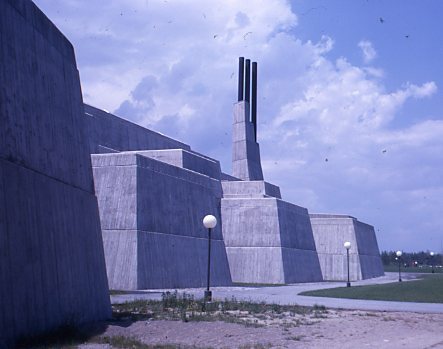 Raw concrete was the rage influenced by Le Corbusier. Though it was late, Scarborough is usually described as exemplifying the New Brutalism, a term promoted by English historian Reyner Banham. No sooner had Banham’s book been published than James Stirling, Banham’s hero and leading exponent, publicly disowned his Brutalist label. It was very embarrassing. Wikipedia defines a megastructure as: ‘…an architectural concept popularized in the 1960s where a city could be encased in a single building or a relatively small number of buildings interconnected. Such arcology concepts are popular in science fiction.’ It offers Arthur C. Clarke’s, Rendezvous with Rama as an instance. As Banham anticipated, megastructures were short-lived and failed to gain wider traction, but they did indelibly mark post-war architecture, especially the 1960s. Currently we find many instances of megastructures, most are multi- or mixed-use towers rather than the extended linear variety indicated by Drexler. The Great Wall of China might be termed the first proto megastructure with its long terrain following wall snaking across China’s wild north-west frontier, punctuated at regular intervals by forts to house troops. Scarborough College exhibits much the same feeling with its cranked stepped elevation mimicking the upward slope of the ravine. Often missed and unremarked is the Futurist connection. The three boiler chimneys, sloped walls, stepped floors, multi-level communications, and the dour introverted interior quality of the forms echo the imagery of, Stepped Profile Building on Two Street Levels, and Electric Power Plants, produced by Antonio Sant’Elia as illustrations for his Futurist La Città Nuova project, 1914. One series in particular stands out, this was on industrial building; the arrangement of the three stepped chimney stacks at Scarborough seems to have deliberately echo the Sant’Elia formula to the point of including a false chimney to make up the number. 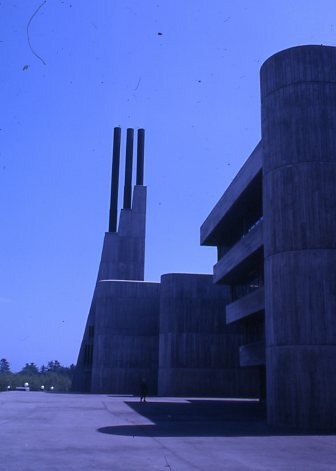 at Scarborough he composition of three chimneysThe rugged raw concrete ravine elevation of the science laboratory wing of Scarborough in particular is strongly reminiscent of Sant Elia’s Futurist city imagery. It was the combination of such Futurist imagery--whether accidental or intended—in combination the client’s innovative television driven education programme that lent Scarborough college such immediate and contemporary potency at its reception in 1966. The success of Scarborough College led to a flood of commissions and master plan work including the nearby primary school for Bellmere. The school consisted of single-storey class rooms with pyramid roofs which were clustered around the central main hall. Once more Andrews had responded to climate, dreary dull winter days, with skylights in each class room repeated so the entire thing resembled a Nigerian village. The African theme was repeated in African Place at Expo 67 based on what was claimed to be ‘an inherently flexible system of prefabricated roofs assembled on site. Drew, Philip. Third Generation: The Changing Meaning of Architecture. Gerd Hatje, Stuttgart & Praeger, London, 1972, pp. 144-151. John Andrews in association with Page & Steele; Planner, Michael Hugo Brunt; Landscape Architect, Michael Hough & Associates; Engineering Consultant, Ewbank Pillar & Associates. 1962-66. Whiteson, Leon. Modern Canadian Architecture. Edmonton, Hurtig, 1983, pp. 124-127. Oscar Newman, ‘The New Campus’, Architectural Forum, 124, May 1966, pp. 30-41, 52-55. Architectural Record, 140, September 1966, pp. 161-64. COLLEGES: ‘A Satellite Built for TV’, Time magazine, vol. 89, no. 2, January 13, 1967, pp. 32-35. Kenneth Frampton, ‘Scarborough College’, Architectural Design, April, 1967. See expo67, official guide, Montreal Canada, April 28--October 27, 1967, Maclean-Hunter Publishing, 1967. For descriptions of the pavilions see pp. 114 (USA Pavilion), 30-31 (Habitat 67), 132 (Germany). Arthur Hailley, a friend of J.B. Parkin, followed the design of the T1 Terminal at Malton between 1957 to 1964 and later used the knowledge he acquired about architectural and operational aspects of the project to write the novel, Airport, 1968. ‘A Satellite Built for TV’, Time magazine, vol. 89, no. 2, January 13, 1967, pp. 32-35. On many levels, Andrews resists easy categorization; this is made all the more difficult because Scarborough college is such a profoundly unrepresentative work; his later architecture is much more consistent and hence, a more reliable indication of his architectural method. Like many Australians, Andrews distrusted architectural theorizing and history. His approach, at least on the surface, is strongly pragmatic, yet, under the surface, there plainly are debts--if hidden and unstated. The most obvious influence, after le Corbusier, is of course Louis Kahn. In works such as Guelph Student Housing, and Smith College Art Complex he follows much the same geometrical iconography as Kahn but without the same historical rootedness. Andrews inherits from Kahn a delight in the raw, but he lacks the finess of Kahn. Andrews was exposed at Harvard to such outstanding teachers as Sigfried Giedion, Josep Luis Sert. Unlike Harry Seidler, who was profoundly affected by Giedion, little of the same attachment to history is evident. Sert left stronger traces in his emphasis of rationalism. Jennifer Taylor lists Aldo van Eyck, namely his Municipal Orphanage, Amsterdam (1957-60) to account for the additive approach in Bellmere Primary School (1965) and Africa Place. Andrews is also indebted to Herman Hertzberger, for his emphasis of place and occasion exemplified in works such as the Montessori School in Delft (1966-70). Andrews’ anti-intellectual attitude, frequently aggressive and derisive attitude to criticism, was very typically Australian. He readily slots into the Brutalist box, and seemingly remains true to its overall orientation of raw concrete, rational planning, with an attempt to accommodate the human dimension and interaction, yet his buildings are often, if anything, but that. The buildings come across as hard, strongly engineered and unwelcoming, unreceptive to people, and impersonal. This may be a product of his large output, whether at master plan level, or distance from the actual details as executed. Andrews is in marked contrast to an architect such as Revell whose Finnish heritage focused on beautiful original details in addition to unique and original conception. One might say of Andrews that he produces a mass architecture mode, architecture rather like the 1920s Moscow Constructivists. His architecture treats people as a mass, an anonymous class, on the move, for whom the architect is bidden to design efficient, functional, though impersonal structures, on a large scale. Unlike the Renaissance, which used the individual as the measure of all things, Andrews has a lot in common with the Communist perception of mass humanity. He is, wittingly of otherwise, a Constructivist in the true sense, emanating in the first place from sculpture, and being constructed of various elements and being part of the broader movement of Functionalism . EXPOSITIONS – “Man and His World”, Time magazine, vol. 89, no. 18, May 5, 1967, p. 34. The idea for the internal street was borrowed from Le Corbusier whose Unite d’Habitation at Marseilles (1952) had an internal street with shops and social facilities half-way up. See. Taylor, J. John Andrews, p. 34. Banham, Reyner. 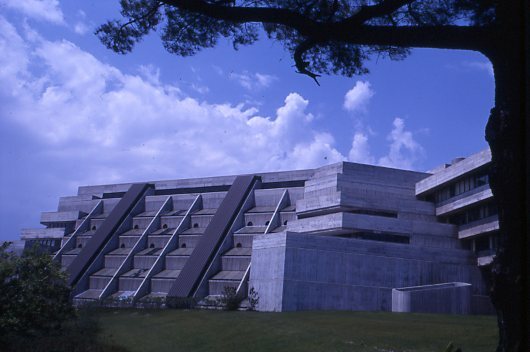 The New Brutalism: Ethic or Aesthetic? The Architectural Press, London, 1966. ‘Brutalism’ entry in Hatje, Gerd (Ed). Encyclopaedia of modern architecture. Thames and Hudson, London, 1971, p. 61. Andrews adds, “Instead, the forms have been formalized as part of a ‘contemporary style’ in architecture and the reasons for them have been misunderstood or disregarded.” Taylor, J. John Andrews, p. 47. Banham, Reyner. Age of the Masters—A Personal View of Modern Architecture. The Architectural Press, London, 1975, p. 144. See Antonio Sant’Elia. teNeues, Dusseldorf, 2003, pages 42, 54-55, 57, 60, 68. Tisdall, Caroline and Bozzolla, Angelo. Futurism. Thames & Hudson, London, 1977, pp. 127-9. See expo67 catalogue, op.cit. pp. 147-156.